There is a drought, at the moment. Not the kind of drought that kills people and livestock, but the kind of drought that leads to the cessation of questions being asked, of deep, terrible thoughts being entertained, of people really looking deeply into life and wondering just what the hell is going on. We live, sure, but we are also controlled by mass media – most of the time, we have opinions that were carefully created for us, or even in an offhanded way – and mass media dampens those moments of “….”, those moments when you are just stunned into silence, even though your mind is racing. Thank goodness for J. Robert King‘s Angel of Death, and Angry Robot for bringing us this novel. As I mentioned to Rob on Twitter, this book is brutal, uncompromising, unsettling… I felt slightly abused at the end of it, rough around the edges and shaken. 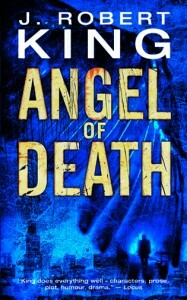 Angel of Death is a difficult book to pin down – it has touches of the supernatural (or does it? ), it is a murder mystery viewed from the intimacy of the minds of killers, it is a love story, and it is a meditation on the myriad meanings that we, as human beings, push onto the struggle of living. I found everything in this book – horror that really creeped me out, beauty in the style and simple evocative use of words that Rob employed, moments of utter revulsion and anger and misery (my roller coaster of emotions while reading), and much more besides. I found myself rooting for every character – the victims, the two characters around which the story revolves, even the characters that made my bile rise in my throat, but I hated them all, too, for reasons I can’t really explain. I mean, you can really like being around someone, enjoy their company and enjoy getting to know them, but some thing starts scratching at you, some thing draws your attention and before you know it, you loathe and like the person in equal measure. But Angel of Death also has some incredibly uplifting moments, moments that helped me see past the brutality of the book, through the shocks and violence, and the even these hectic, cringe-inducing moments had their own stark kind of beauty – I can only liken this to the kind of brutal beauty an explosion seen from a distance has, the kind of thing that you wish you had never seen or experienced but miss, all the same. This is also a novel that played with my expectations – Rob divided Angel of Death into three ‘Books’, and each book could be a full-length novel in its own right; not in terms of the length of these Books, but in terms of the events -the twists and turns and the paths the characters take – and led me down paths were I thought, more than once, “Okay, I think this’ll happen, yep, seems logical, seems right,” only to be punched in the gut with a turn I never expected. I found Angel of Death to be an utterly masterful novel – one of those novels that truly only comes along very, very rarely. And it’s still echoing through my head – I replay scenes, hear the dialogue, see the imagery, feel the emotions… I haven’t read anything quite like this before; it stunned me completely, and I truly hope that this book finds its way into the hands of many, many people. It’s the kind of book that changes you on the inside, that really leaves you shaken, but at the same time, brings into in sharper focus that which gives our lives meaning, and as such, I just can’t give this book a rating. Do yourself a favour and read this. Check out Rob’s site here. It goes without saying that I’m trembling while awaiting Rob’s next Angry Robot novel, Death’s Disciples. Stay tuned for details! AR are sending out some really good books! I’ve noticed that too, the books that AR is involved with are getting better and better. well done.